November 15th is a date of parallel roads, several things done at once and multitasking of all sorts. It is a time when one's mind goes in one direction, and their heart in the other, and to merge them into one to fight for a specific goal, people born on this date need to be deeply honest with themselves about the way they feel in each specific situation. It is easy for emotions to get shoved aside here, leaving little room for cleansing and healing of the higher order if the mind isn’t willing to recognize the potent energies carried in one's most fragile inner world. The planetary row of those born on the 15th of November is all about self-expression and getting out of the loop of talk that isn’t coming from the core of one's authentic personality. Small talk will rarely be tolerated here and relationships with siblings, close relatives, neighbors and everyday contacts could color their world with too many attitudes that aren’t their own. Walking and movement is of the essence here, as these individuals need to keep their energy in motion so they can get in tune with their personal needs despite all those of other people. 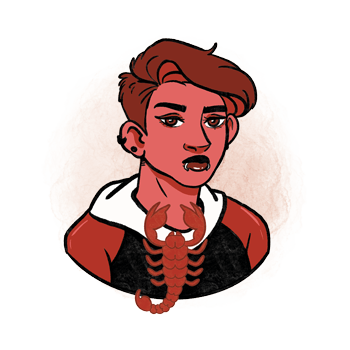 Messengers among Scorpios, they have something important to say, often buried below layers of learnt beliefs and attitudes that must be released along the way on their quest for the truth. "A Rabbit Metamorphoses into a Nature Spirit"
This is a wonderful symbol for people born on this date, speaking of their quick and agile nature that leads them towards the state of higher consciousness. Instinctive and matters of the body will work them towards answers they seek, and it is good for them to search for their animal guide and color their life with beings from Nature they are surrounded by. The message of change is emphasized here, where one needs to let go of their fear and obvious physical vulnerability and stop running so they can ascend to the spiritual being they were born to be. Mars guides those born on November 15th, pointing out the importance of the physical world, instinctive battles, personal boundaries and fear. They need to find their grounding, feel safe and secure on their own two feet, and relationships that make them dependent will rarely make them happy. They are to incorporate their energy into regular flows, have a healthy routine and care for their body, aware that the world is rich with resources that can be used so they always have a way of meeting their primal needs. 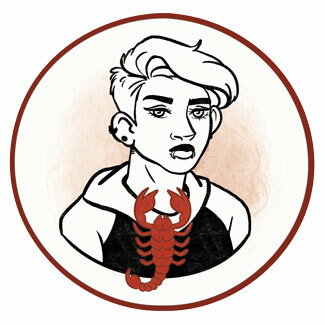 Governed by instincts, Scorpios born on the 15th of November rarely know exactly why they chose the partner they chose. Even when extremely rational and seeking intelligent solutions and someone to talk to, things still easily spin out of control as soon as sexuality gets involved. Physical touch could affect friendships and close contacts, and to merge the two, one must let go to full intimacy, believing in their own place in someone else's life instead of simply counting bruises from the past. None of the two extremes, physical or mental, should be in any way dismissed here, as they are meant to merge in one deep relationship, rather than be quenched in any way. To live in this moment and truly connect with one partner, these individuals need to build their own sense of security and be fully independent, so they don’t get sucked into symbiotic bonds that require both parties involved to give more than they managed to create. Sensitive and deeply emotional, they need someone they will protect just as much as they need to be protected themselves. They must keep in mind that other people's troubles and pains aren’t theirs to analyze or carry. It is up to them only to show that they are stable, constantly there and a pillar of emotional support for their loved one to resolve their personal issues on their own. Those born on the 15th of November excel in martial arts, bicycle riding, all sorts of races and activities that require one on one contact. They are filled with initiative, ready to interact and give their energy where it is needed, and when they build a solid personal foundation, they often become philanthropists and those who financially and physically support others. They will do well as physical therapists, chiropractors and masseuses, and work well with hands carrying a healing energy in their touch with Nature. Agrellite is a good choice of stone for those born on November 15th, helping them with ways of self-expression that are grounded and deeply personal. It prevents writers block and stimulates their need to get words out into the open, where they can see them and organize them in a focused manner. It alleviates anger and improves one's mood, showing hidden blocks to spiritual growth, cleansing connections with others on an energetic level where things cannot easily be cognitively explained. Giving protection from their own need to control and dominate others, it is highly beneficial for their personal boundaries to be set. November 15th born are curious, open for new information, and always love getting a book, a puzzle, or something to assemble and communicate with in their everyday lives. A kit with different tools, some clay, a new keyboard or a fancy pen are always a good option, and they might enjoy a course in calligraphy or public speaking, depending on the need of the moment. Take them out for a karaoke night or take them dancing, allowing movement and expression of emotion without restrictions. Intelligent, original in their ideas while deeply practical, they are providers and stable individuals who hold their ground and know just what to say at the right moment. Eloquent and quick, they move with grace and resolve problems as they come to surface with reliability and common sense. Talking too much or too little, distant from others and unable to metabolize experiences and attitudes that aren’t their own, they could take too many things personally and push their dominance on those who are weaker or less mature. In 1940 Roberto Cavalli was born, an Italian fashion designer who patented a printing procedure on leather. He is also the inventor of the sand-blasted look for jeans and known for his signature animal prints. In 1940 Sam Waterston was born, an American actor and director, recognized mostly for his roles in Law & Order and The Killing Fields. He is an active humanitarian involved in numerous causes, and got awarded for his longtime support for refugees around the world. In 1972 Jonny Lee Miller was born, an English American film and theater actor who starred in Mansfield Park and The Flying Scotsman, and also the first husband of Angelina Jolie (born on June 4th). He is a marathon runner and a supporter of rare disease organizations. 1791 – The first Catholic college in the United States starts working. 1920 – League of Nations is first assembled in Geneva, Switzerland. 1926 – Opening of the NBC radio network. 1933 – The first election is held in Thailand. 1955 – Opening of the first part of Saint Petersburg Metro. 1971 – The first commercial single-chip microprocessor in the world is released by Intel.